Play R&RJiS Video Game Free! Do you have a minute? 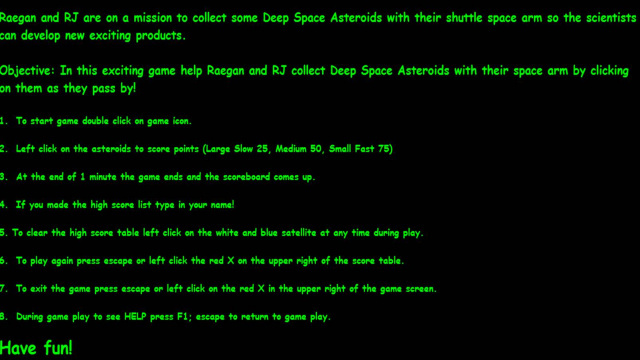 Download this free R&RJiS video game and help Raegan and RJ collect some deep space asteroids! 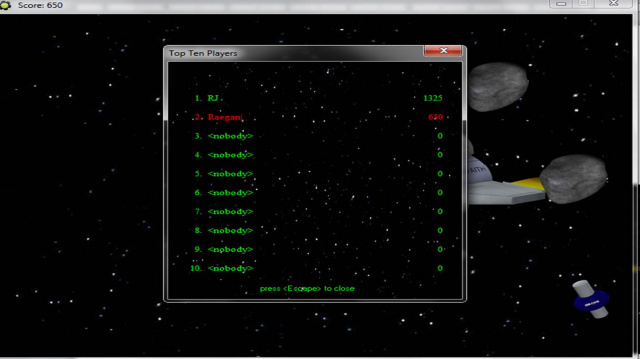 This is a free R&RJiS video game called "Deep Space Asteroids!" created by the author for you to download free and play. Note: this game is inside a zip file so your computer will run it - just left click on the zip file link below, when it loads left click on the zip file to open it, and then left click on the game icon to play - once you have the zip file open you can right click on the game icon and save the game to your computer to play anytime you want!! 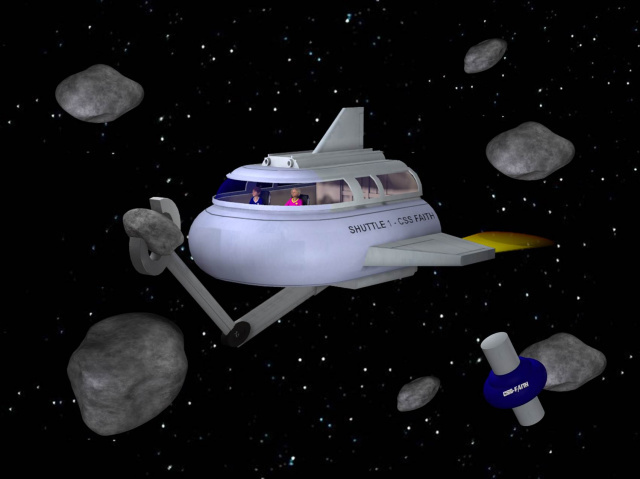 The game is from a scene in graphic novel 3, "Homecoming", where the CSS Faith has stopped their journey home to Earth to explore some deep space asteroids. Raegan and RJ take a shuttle to the asteroid field, place a transponder (the red satellite) on one of the larger asteroids to collect data, and then use the shuttle arm to collect some samples. 1. Download and save file to your desk top. 2. Left click on the game icon to start the game. 3. Press F1 at any time for help. 4. As the asteroids fly by the shuttle, help Raegan and RJ collect them using the shuttle arm by left clicking on them with the mouse. 5. A score is shown in the top left corner of the screen. 6. Each asteroid you click on will give you points (Large & slow = 10 points; Medium = 20 points; Small & Fast = 30 points). 7. At the end of 1 minute the game ends and the high score board comes up. If you made a high score type in your name. Existing high scores are purple. If you made the high score list there will be green font where you will type your name. Congratulations! 8. Press escape or right click on the red X at the top right of the score box and try to get a higher score. 9. To reset the high scores back to zero left click on the white and blue satellite at any time during play! Once you do this there is no way to get your existing high scores back, so make sure that is what you want! 10. To stop the game and exit press escape or left click on the X in the top right corner at any time. How to play from computer: Left click on file above "R&RJiS Deep Space Asteroids!.zip" and wait for folder to open. When zip file folder opens left click on application to start game and play. How to download to your computer and play: Just right click on the file link above "R&RJiS Deep Space Asteroids!.zip" to download it to your computer, save to your desk top, open the compressed / zip file, right click on the video game file, and save or move it to your desk top. Then left click to start. Note: This is a tricky download. The downloads on the "Free Download" previous page were easy because they were not '.exe/application' files, and so did not alert your anti-virus software. This is a '.exe/application' file, because it contains the video game that will run when you left click on it. It is harmless, because it has been scanned by Norton, the software I use, when it was loaded up. However, some internet security software do not like to download '.exe/application' files because they may contain viruses. This one does not. Once you download the .zip folder and move the file to your desktop, your internet security system will let it play. If it asks whether the application is 'safe', you can double check by running the scan for virus', then code it as safe.